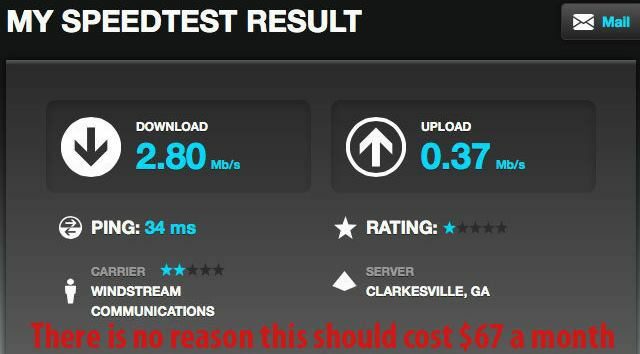 Windstream Archives · Stop the Cap! 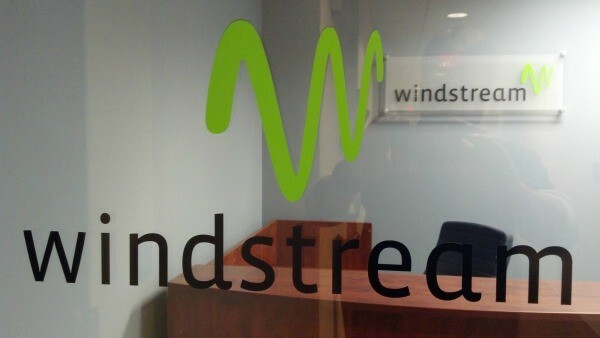 Windstream Holdings, Inc. filed bankruptcy this afternoon, citing its inability to cover $5.8 billion in outstanding debt. The independent phone company, which provides legacy landline and broadband service to around 1.4 million customers in 18 states, filed voluntary to reorganize under Chapter 11 of the U.S. Bankruptcy Code in the U.S. Bankruptcy Court for the Southern District of New York, citing a judge’s decision almost two weeks ago that the company defaulted on its obligations. Windstream received a commitment from Citigroup Global Markets Inc. for $1 billion in debtor-in-possession (“DIP”) financing. Assuming a bankruptcy judge approves of the arrangement, Windstream claims this stop-gap financing will allow it to run its current business as usual. 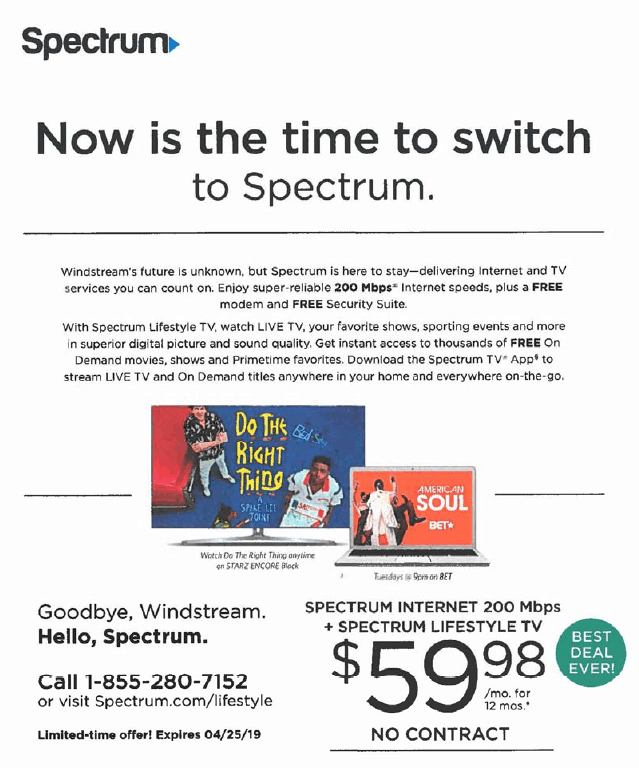 Windstream provides residential service in 18 states including: Alabama, Arkansas, Florida, Georgia, Iowa, Kentucky, Minnesota, Mississippi, Missouri, Nebraska, New Mexico, New York, North Carolina, Ohio, Oklahoma, Pennsylvania, South Carolina and Texas. 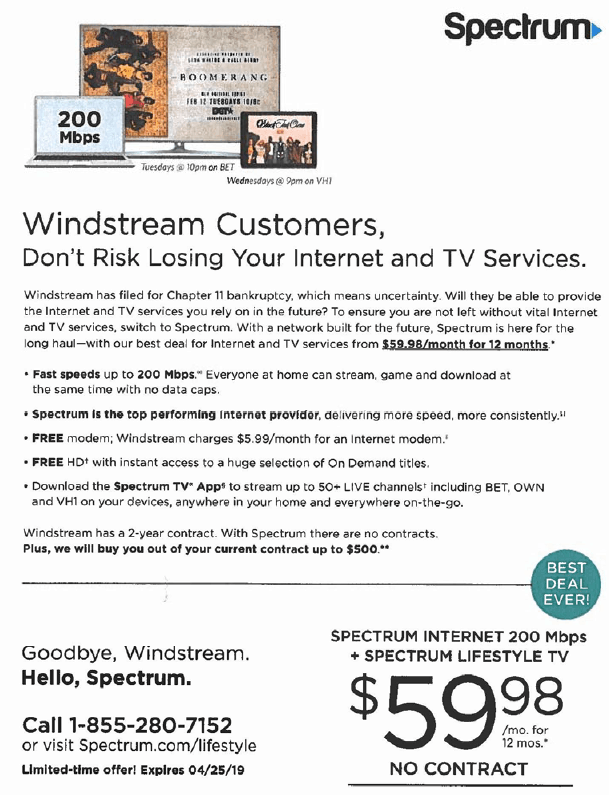 The company claims it was forced into bankruptcy after a judge found Windstream’s attempt in 2015 to shift its valuable fiber optic network assets off its own books into a sheltered real estate investment trust (REIT) named Uniti Group violated the rights of bondholders which hold some of Windstream’s debt. Those debts are backed, in part, by the valuable fiber optic assets Windstream had spun them off to a new entity. In fact, Uniti’s fiber optic assets are essential to Windstream’s viability. The phone company has the exclusive right to use Uniti’s fiber assets and two-thirds of Uniti’s revenue comes from Windstream, making the two companies inseparable. Windstream’s bankruptcy is a concern to investors of both companies because it will allow Windstream to renegotiate the terms of its contract with its fiber partner. Windstream customers are equally concerned because the phone company needs Uniti’s network to manage its broadband service. The judge’s decision on Feb. 15 to declare the arrangement inappropriate was reportedly a shock to the investor community, which has made money buying repackaged corporate debt in the form of bonds for years. Corporations have issued bonds to retire older debt, while giving investors a piece of the action. Since investors are making money, they typically do not complain too loudly about the persistence of corporate debt, frequently repackaged in new bonds. As a result, companies can hold onto more cash used to pay shareholder dividends and executive compensation instead of permanently retiring debt. Aurelius, a hedge fund, is making some of its money scrutinizing these arrangements looking for contract violations such as the Uniti spinoff. When it finds one, it takes a stake in the company and then threatens to sue as a harmed investor. Based on the judge’s decision, Aurelius won a judgment that will effectively empty the pockets of many of the bondholders and investors that could lose a lot of their investments because of the bankruptcy. If the hedge fund is going to actively seek other questionable arrangements or violations of bondholders’ rights at other companies, it could cause an earthquake in an investment community that has quietly conspired with companies to generate transactions that enrich investors while allowing companies to carry more debt. Customers could end up covering some of the costs of today’s bankruptcy filing if Windstream files a plan with the Bankruptcy Court promising to raise prices to help it demonstrate ongoing viability. Windstream’s Thomas complained the phone company is little more than a victim of a predatory hedge fund out to enrich itself at the expense of others. Despite claims from some industry-backed researchers and former members of Congress that Net Neutrality has reduced investment in telecommunications, a new research note from Deutsche Bank shows America’s top telephone and cable companies are spending billions on fiber upgrades to power wireless, business, and consumer broadband. “Telecoms have become much more public signaling their intent to increase fiber investment, with AT&T and Verizon leading the spending ramp,” reports Deutsche Bank Markets Research. 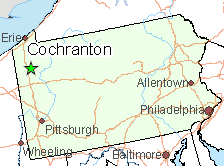 Verizon has been on a fiber spending spree in the northeastern United States, signing contracts with Corning and Prysmian worth $1.3 billion to guarantee a steady supply of 2.5 million miles of fiber optic cable Verizon plans to buy over the next three years. Much of that spending allows Verizon to lay a foundation for its future 5G wireless services, which will require fiber to the neighborhood networks. But in cities like Boston, Verizon is also once again expanding its FiOS fiber to the home service to consumers. 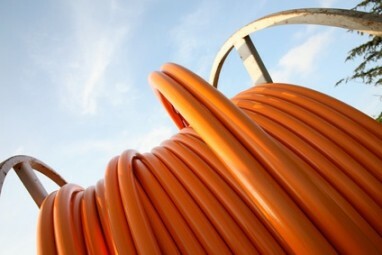 AT&T is committed to connecting 12.5 million homes to gigabit-ready fiber broadband by 2019 — part of a deal it made with the FCC to win approval of its acquisition of DirecTV. AT&T claims it has already connected 5.5 million homes to its gigabit AT&T Fiber network, expected to reach 7 million by the end of this year. Deutsche Bank thinks providers’ future drive towards 5G service will also simultaneously benefit fiber to the home expansion, because the same fiber network can power both services. 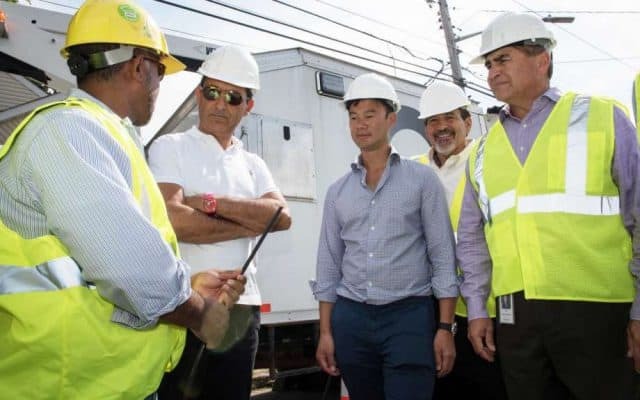 Altice founder Patrick Drahi (second from left) and Altice USA CEO Dexter Goei (center) visit a Cablevision fiber deployment on Long Island, N.Y. The bank predicts companies will spend around $175 billion over the next 10 years building out their fiber networks, with most of the spending coming from the phone companies, who may see fiber buildouts as their best attempt to level the playing field with cable operators’ hybrid fiber-coaxial cable networks. As cable operators expand their networks to reach more business parks, they have been gradually stealing market share for phone and data services from phone companies. Consumer broadband is also increasingly dominated by cable operators in areas where phone companies still rely on selling DSL services. FierceCable notes Comcast and Altice have stepped up aggressive spending on fiber networks for their consumer and business customers. Altice is planning to decommission Cablevision’s existing coaxial cable network and move customers to fiber-to-the-home service. Comcast is deploying fiber services while still selling traditional cable broadband upgraded to DOCSIS 3.1, which supports substantially faster broadband speeds. The two networks co-exist side-by-side. 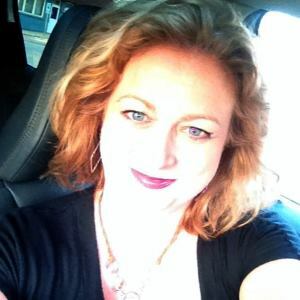 Customer need dictates which network Comcast will use to supply service. Customers benefit differently in each state, depending on what type of service is available. 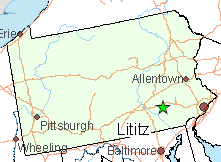 Comcast’s large footprint in Pennsylvania, outside of Philadelphia, is usually served by traditional coaxial cable. Verizon still sells DSL in much of the state. In Massachusetts, Verizon is building out its FiOS network to serve metro Boston while Comcast will depend on DOCSIS 3.1 upgrades to speed up its internet service. In New Jersey, long a battleground for Verizon’s FiOS service the company stopped aggressively expanding several years ago, Comcast has announced DOCSIS 3.1 upgrades for the entire state. Independent phone companies are also seeing a bleak future without fiber upgrades. 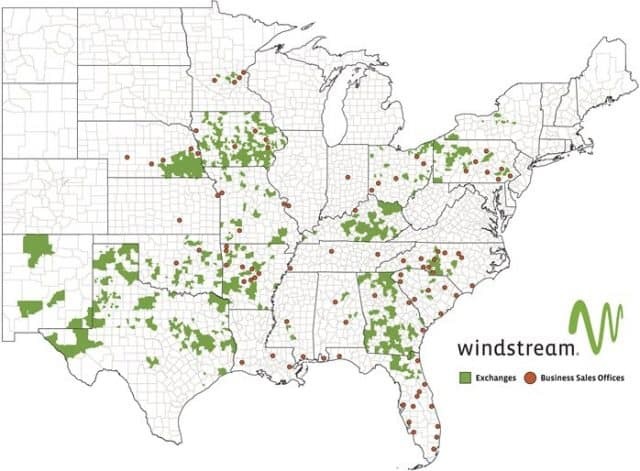 Both CenturyLink and Windstream are planning moderately aggressive fiber expansion, particularly in urban service areas and where they face fierce cable competition. Frontier continues its more modest approach to fiber expansion, usually placing fiber in new housing developments and in places where its copper facilities have been severely damaged or have to be relocated because of infrastructure projects. None of the companies have cited Net Neutrality as a factor in their future broadband expansion plans. In fact, fiber networks have opened the door to new business opportunities to the companies installing them, and the high-capacity networks are likely to further reduce traffic/transit costs, while boosting speeds. That undercuts the business model of selling digital slow and fast lanes.